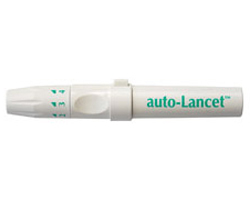 The incomparable auto-Lancet is the lancing device that has set the standard for quality, comfort, and adjustability since 1983. This re-usable lancing device assists in obtaining capillary blood samples for testing. The auto-Lancet is constructed in the USA of durable plastics for precision lancing day after day, year after year.